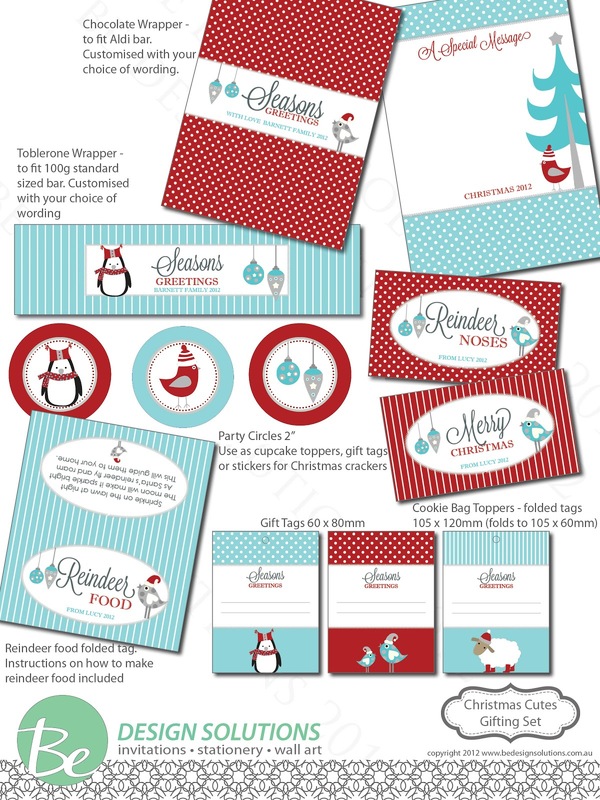 So you love the freebie chocolate bar wrappers created by the fabulous Be Design Solutions?! Well you are going to LOVE the rest of the set too, and for one very lucky reader this set is going to be all yours and personalised for you, for Christmas time!! - Party Circles - perfect for cupcake toppers, gift tags or stickers for some DIY Christmas crackers perhaps?! And you can choose from Silver Grey/Red, The Aqua/Red (my personal favourite as you can tell!) or the Green/Red version. The prize includes each of these files emailed to you, for you to print to your hearts content (not for re-sale or commercial purposes). A BIG thank you to Be Design Solutions for generously donating this little giveaway. If you are interested in purchasing the entire range to make your Christmas festivities beautifully co-ordinated and chic this year, then the range is available to purchase for a mere $25.00 per set. Contact Be Design Solutions to order or for more information. Good luck and please see below terms and conditions for this giveaway. Terms & Conditions- The giveaway will be hosted by Rafflecopter and is open to every single one of my readers - yay!!! Karen from Be Designs is seriously one clever lady isn't she?! What the indeed?! I think that is going a bit far for the school to say that! !